Disclosure: Chewy sent a Zogoflex Air Dash toy to Lapdog Creations, free of charge, for review purposes. I was not compensated for this review and all opinions expressed are my own. The Lapdogs are always excited when a Chewy box lands on our doorstep, but this month was extra special because our box had two items inside! 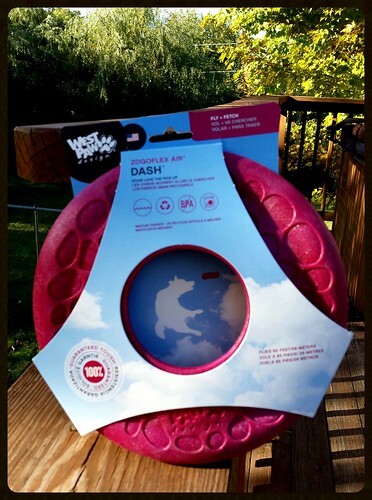 We'll tell you about the second item next week, however, because today is all about the Zogoflex Air Dash Frisbee from West Paw! This is not your average Frisbee by any means. In fact, Zogoflex Air Dash is pretty unique. No, it's not meant to double as a funky picture frame, but how could we I resist? One of the first things I noticed was the aerodynamic design, which is amazingly comfortable in my hand. It also makes Dash very easy to throw, and the center hole allows for a smooth, off the ground pickup and a stable, fast flight. 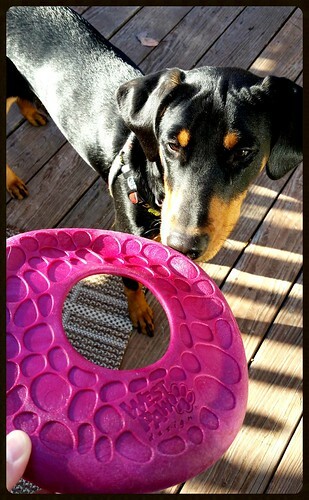 The durable outer shell surrounds a soft foam material on the inside, which results is an 8" round tough toy that won't hurt dogs' mouths... or human hands. It's so tough that it rates a 3 on West Paw's Durability Rating ("perfect strength for medium chewers"), but do remember Dash was designed for interactive and supervised play. Dash isn't just for fun on land, however. It floats, which means you can take your game to the pool or beach and enjoy hours of fun in the water too. But it's not just your average pool toy either. Thanks to the lightweight, air-injected center, Dash floats higher, making it easy for swimming dogs to spot. If we ever go into Dock Dogs, this would be perfect! While the Lapdogs weren't quite sure what to make of the Zogoflex Air Dash, their Mama loved it! Neither Tut or Sophie have ever shown much interest in any Frisbee, so it was no surprise that no matter how many times I tossed Dash, they just stood and looked at me as if to say "So, where's the treats Chewy sent?" My hopes remain high for some quality Frisbee time with Penny, however. She loves playing fetch with her ball (or whatever toy you might want to toss around), so I'm hopeful that after some bonding time with Dash she'll catch on to the high flying game soon. The weather hasn't really allowed us to get outside to practice too much lately and Dash is not an inside tossing toy by any means. Designed, sourced and Made in the USA! 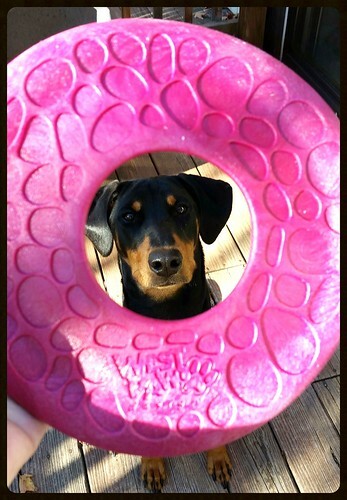 Think your pooch would love a Zogoflex Air Dash of his or her very own? 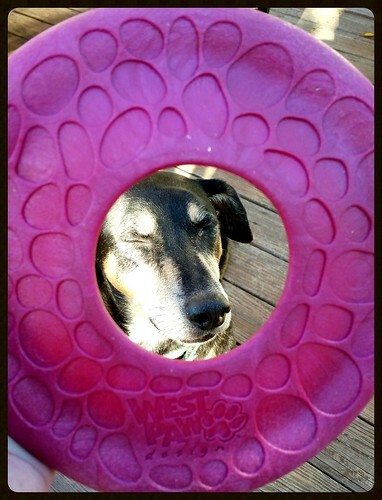 Grab one at Chewy today, and while you're at it check out the other fun toys from West Paw. 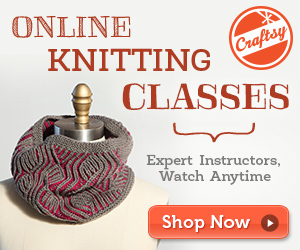 Remember, 1-2 day shipping is always free on orders of $49 or more! It's the perfect time to start your holiday shopping or restock the treat pantry. 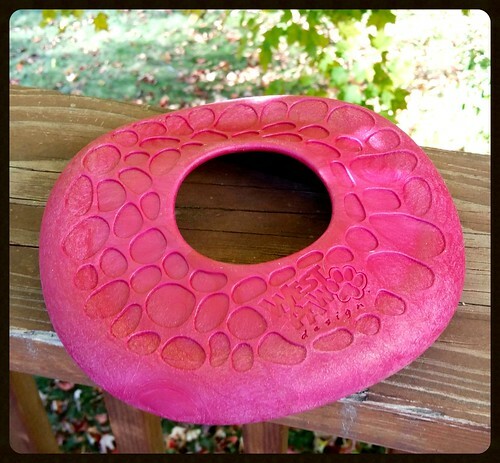 Perfect for Water Dogs who love to play frisbee either in the yard or in the lake. Rob is very proud that Mackey has learned to catch and can sometimes even catch the frisbee. Looks like a fun toy. I bet the dogs will figure it out too. Guaranteed against MOI chewin' pieces off??!!! What?! Wells, then I gots to check that out! PepiSmartDog: oh I LOVE your photos!!! I laughed out loud when I saw you winking at me through the center of your frisbee! Great product review.